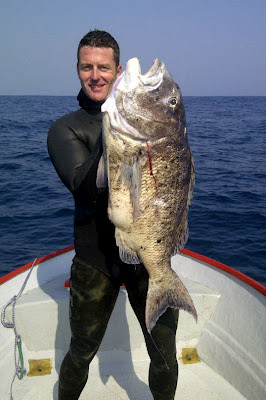 With all the rain on the KZN coast about the only place to go spearfishing at the moment is Cape Vidal. Desperate to get our gills wet, we headed up the coast on Wednesday for a quick day trip to see if we could get some diving in. 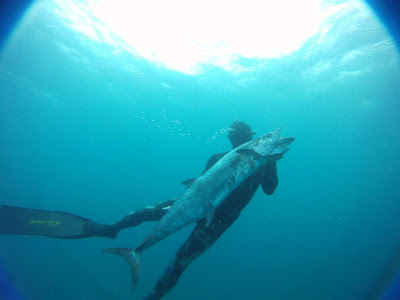 Cape Vidal in December can be frustrating as it can be extremely quiet, the early spring shoals of 'return' Couta (these are Spanish Mackerel big and fat from feeding on the shoals of sardines down south during winter that go back to Mozambique during the summer) and the Wahoo run have come and gone. That is not so say you wont find the odd straggler or early shoal Couta , but generally the action only starts in mid January. Never the less with no other diving going on we headed up and we were blessed with some nice clean water. As was expected the fish were quiet and we only managed to get one small Couta. Some other friends of mine also went up, but they stayed the night at Vidal and got on the sea early and Hein managed to get good Couta early on in the morning. Apparently there were a few fish around early, which is typical of Leven Point. These early fish usually disappear once the sun is up and more boats arrive. After a few hours of fishless drifts we headed out to the dep pinnacles at Deep Oscar. On my first drift even though the current was screaming I landed right above the bump. 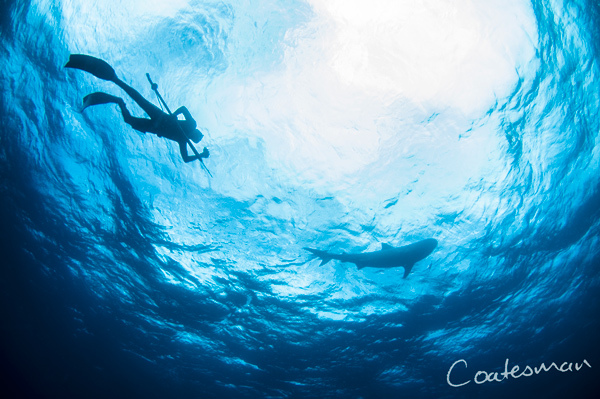 As I dived I saw a couta deep below me and swam down to intercept the fish. 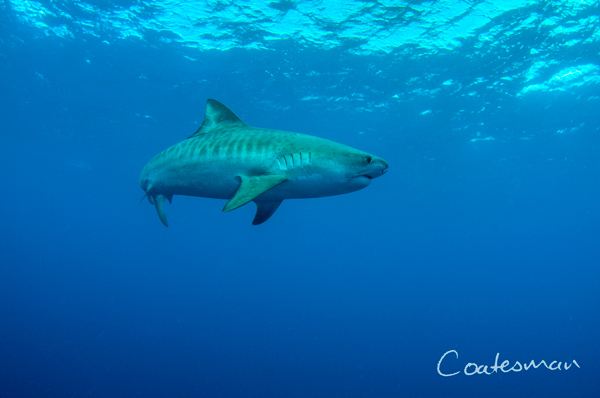 But when I levelled out at about 28m with the fish, I was joined by 3 Tiger Sharks, a Zambezi and a Grey Shark. If that was not enough there were a couple Potato Bass circling below just off the reef. It was like they were all going, "come on we dare you to shoot!" For once I heeded my better judgment and did not take the shot, but situation I found my self in was absolutely awe inspiring. Sharks and other predators all congregating, almost like animals at a watering hole in a drought. So when I hit the surface the speargun was quickly swapped for a DSLR camera. We battled to get on the exact spot again, also diving with a large camera housing that resembles a potjie pot did not make it any easier. never the less we had some Tigers come up and follow us around for a while. One of the sharks was extremely large and fat, possibly one of the biggest Tigers I have ever seen. This big shark as obviously been around the block a few times and was a bit camera shy and was not keen to get too close. Although we did not get many fish, it was a great day out and diving with all the sharks was rather cool. The water here at home is still brown and the rivers are still pumping so there is a good chance we will head back to Cape Vidal this next week again. Hopefully we can get lucky this time with some better fish. This weekend was the first time in a while that the water actually started to look good. Most guys got in somewhere along the North Coast, and although the fish where generally quiet some got a few Snoek in the shallows. I managed to get in yesterday and got my first Couta of the season. Guy Leme and myself had been diving all morning and it was hard going. The current was screaming and making it hard stay close to the boat, let alone to stay on the spot. I was actually ready to hit the beach and Guy wanted to have a last look at one of the deep spots that come up to 28m off the Umvolti mouth. His first dive produced a Couta and in no time we were anchored and looking for fish. After a while and nothing coming onto the flasher I started to look on the bottom for reef species Only to have a shoal of Couta swim over me. 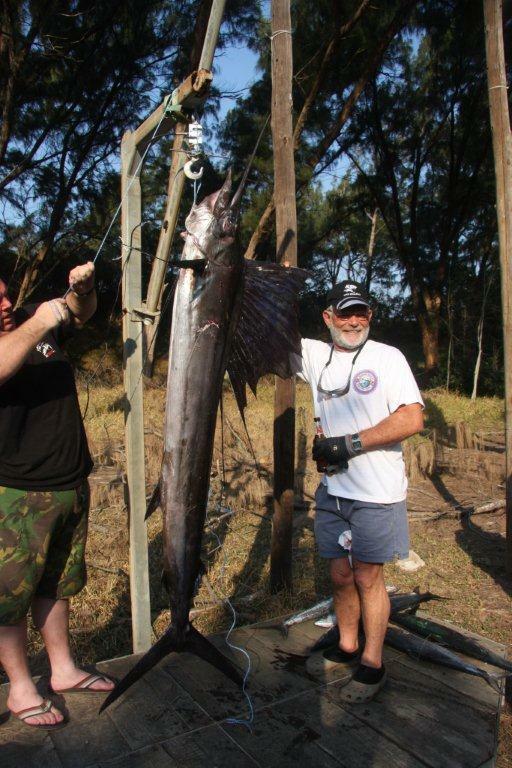 I managed to get a nice fish of 13kg and then another smaller one. It seemed every time I got to the bottom something swam in, but chasing Couta at 28m after a long day is not ideal and I fluffed a shot on a Snoek and dropped a Couta with a bad gut shot. Things were looking good and it is good to see the Couta making an appearance. All this is actually of no good tho considering the amount of rain we had last night and how the rivers are all pumping mud into the ocean. On my way into Durban this morning I snapped a pic of the Tongaat river vomiting mud ..... its damn depressing Especially considering that we have not had a lot of diving and now it will be a good week before it comes right again. Well that is if we dont have any more rain. So forgive if I am not praying for rain! Bonani Cele with his first fish. If you go into the back of the Rob Allen Dive Factory you will find a friendly face, the factory manager Bonani Cele. There is an interesting story behind this man. 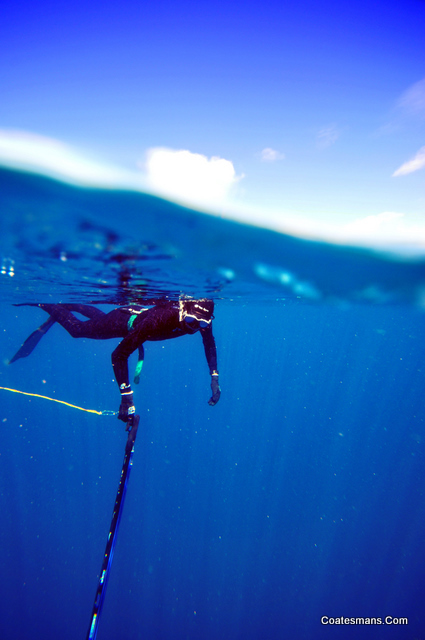 After years at the Dive Factory he became a little more than curious about spearfishing. This lead to him taking part in the PDI course with SAUFF a short while ago, where he was introduced to spearfish and water for the first time. This weekend he joined Dane from the Dive Facs retail store for a dive off the piers in Durban. 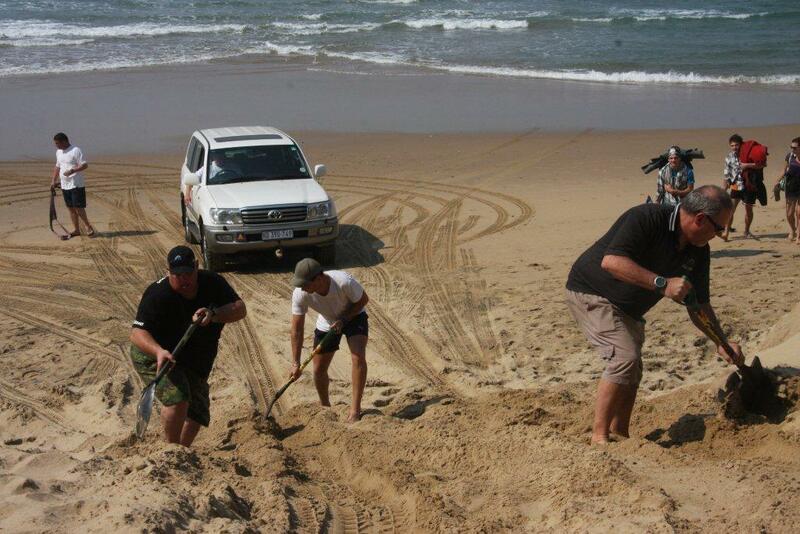 After a while and not seeing any fish Bonani ventured off over the sand and landed up in a shoal of Gunter. Congrats to Bonani, not too many guys can claim to have a class fish like this as their first fish. 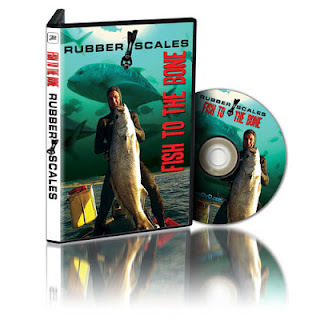 Going East has fast become one of the Top Spearfishing Video's on Youtube and has rack up the highest sales to date on Spearodvd.com a site that exclusively sells spearfishing dvd videos. The video trailers funky slowmo sections, vibey music and awesome kill shots has been the recipe that has made it a firm favourite online. 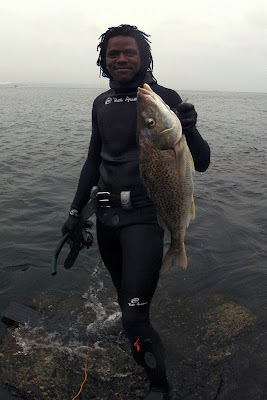 There are some other spearfishing video's with high views, but they have been there for years. 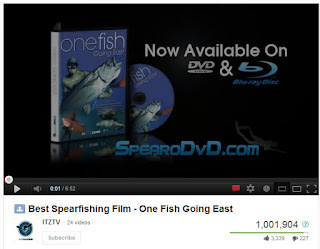 Going East has achieved this in only 9 months, which is good for a spearfishing video on Youtube. I recently got back from an epic exploration spearfishing trip to the Barren Islands off the west coast of Madagascar. 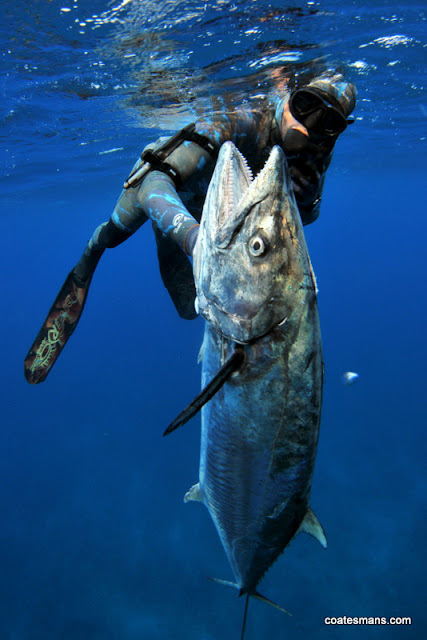 We spent a week exploring 200km of an uncharted reef system looking for giant Dog Tooth Tuna and Black Marlin. We didn't really have any joy with the Doggies, although we did see a couple of very very big fish. On the Marlin side we did see a couple and got close to getting a spear into a really big one. I have been away for the last week and I have gotten back into the office to find Brod Whitticker's new dvd trailer up and flying. before I left I saw an almost finished version of the film which was super cool. Brod is the only guy who can get the angles he does ..... really makes you feel like you are in the water with him. My good mate Barret Harvey has just finished editing down an epic promo video for Eric Allard at Extreme Blue Water Spearfishing in Tanzania. 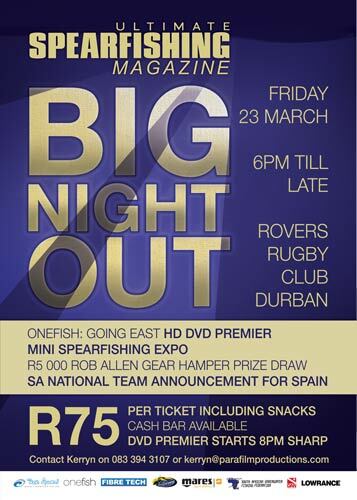 The footage in this promo vid came from a trip some Durban guys did last year and they got some great fish. What is impressive is that most of these fish were shot in well over 30m. Flip and how are those Doggies? Here is something to make you smile. 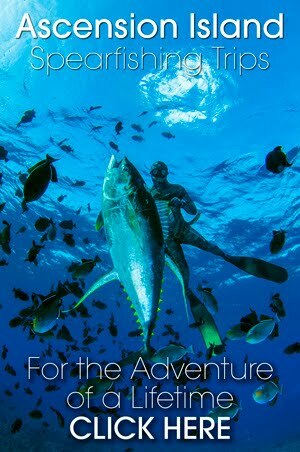 At least some people think spearfishing is cool. Andy Henwood - All 'cracked up' on Deep Scotties. If you did not get in the sea last week best you dust off the running shoes. It is going to be while before the sea come right again, and with even more rain forecast the long term prognosis looks bleak & brown. Andy Henwood took a chance at the end of last week and got out on the Shoal. The reports had been bad with cold green water, but his shoulder operation coming up this week he decided to take his chances as this will be his last dive for the next few months. It looks like he made good on the day and while most of us were waiting for 'better days' he got busy. He said the vis was not good at all and it was very cold. Moral of the story, drop everything and take the gaps! Unbeknownst to any of the SAUFF committee member, there was a change to the registration process for competing in world events sanctioned by CMAS, from a paper submission to a web based submission. If any “unpaid” licences for competing in previous world events where outstanding then the web based registration process could not be completed. Despite the full payment of over €4500 to the organisers, we were never informed that we have not complied fully with the CMAS process. In fact there was no communication from CMAS with regards to the payment of the outstanding licence fees. In the past there has been no problem in sorting these payments out and South African competitors have competed in zones and world events with these outstanding fees not causing issues. A number of these fees date back 4 years. The organisers, FEGAS, and CMAS were very aware that the South African competitors where in Spain as they competed in a friendly competition weeks before the start of the event and had valid licences for diving in Spain. It is surprising that other Federations knew about this problem before any of the South African team or committee members, weeks before the start of the event. The South African side was deliberately kept in the dark and at no time did CMAS make an effort to discuss this issue with us. Three days before the event I went to the organisers and spoke to them about the registration and I was assured that everything was in order. That evening, Jaco Blignaut and I went to drop off the flag and we were told that there was an “issue”, the same afternoon that we had received an email from FEGAS, not CMAS, informing us there was a technical issue that needed to be sorted out. I spoke with the CMAS disciplinary official who informed me that there was an outstanding internet submission that was required. The next morning as soon as possible I paid the outstanding amount of €485 personally and forwarded proof of payment to CMAS who confirmed the payment. With the help of SAUSF we completed the outstanding forms and submitted them. Despite full payment they flatly refused to discuss the matter as they said there was a disclosure on the web site that these fees had to be paid 30 days before the competition. Again there was no information about this given to us, nor any communication from CMAS about this prior to the boys landing in Spain, or at any time before the registration with the Spanish Federation. One would have thought that there would have been some effort to communicate the fact that there where outstanding “issues” before the massive effort of the South African competitors. For three days I fought to get the boys permission to be able to compete. We had complied with all the outstanding requirements as soon as we knew about them. This was the first time these requirements were implemented. CMAS could have allowed us to compete, but decided against it due to a technicality. I cannot explain how gutted and disappointed I was with the treatment of an issue that could easily have been resolved. The South African competitors have sacrificed more than most as we are self-funded and all full time employees. This means not only having to pay in full for the trip themselves but also having to take up unpaid leave in some instances or forgo job opportunities. 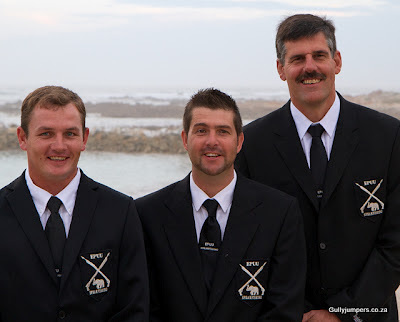 SA spearfishing was made a political example of on purpose as we are a tiny federation with little recourse and we were used as a pawn to “make a point”, but were a significant threat in terms of competing for the top spots. Making a point of disallowing us to participate goes against the very nature of what sport is about. Putting politics before fair competition highlights how CMAS, in my opinion, has lost sight of what they are there for. There could have been many other ways of resolving this issue positively and in the best interests of competitive sport. We are desperately unhappy with the attitude of the regulating authorities and cannot understand why this prevailing attitude should be allowed to continue. It is surely not in the best interests of building this sport for the future. I have organised a meeting with the South African authorities on Monday the 16th July to discuss a way forward and will keep all those involved informed on any progress. As the CMAS World Spearfishing gets under way the South African Spearfishing team is having to sit out. The SA team was barred due to some unpaid subs from last year.... funny they let the team go all the way to Spain to give them the middle finger! This is the message from Iain Ewing from SAUFF who is over there with the boys and tried to sort the issue out. We are out of the compo. No diving for the SA boys at all. Despite all the issues of subs and payments being sorted out the decision was taken by CMAS not to allow us to dive. it's been a hectic few days trying to resolve what we thought was a fairly simple issue. We are very disappointed! Both with regards to not being allowed to compete and the way we have been treated. We have always understood that regulating authorities are there to help with the development and facilitation of sport not the dictation and preclusion of small federations. This is truly a very sad day for the SA side who had giving up work and huge amounts of their own cash to be there. I know Jaco was in fine form and was hungry to show the world what he could do. Maybe the Europeans are just scared?? Just think about that for a moment! Spearfishing competitions in the best spots with real fish not eels and palm sized Black Tail. How practical I don't know? But it will be a hell of a lot more interesting. 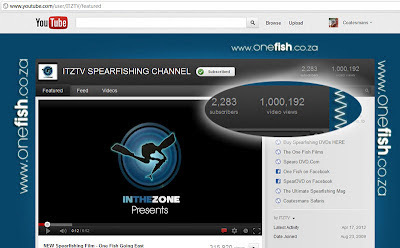 Today is a special day as the Spearfishing production company that I am involved with called In The Zone has cracked the 1 Million views mark!!! 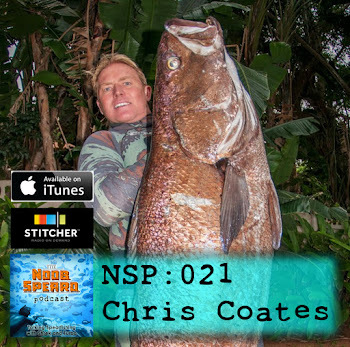 I know this is not massive in Youtube terms, but in the world of spearfishing it is BIG. In fact its the channel with the most views and subscribers out of the dedicated spearfishing Youtube channels. This partly due to the fact that our latest trailer for the film Onefish Going East has over 300 000 views in just a few months. I think the 2283 loyal subscribers who like our films also help, and having this many subscribers is also a huge achievement. A big thanks to all the crew that have contributed to reaching this milestone. 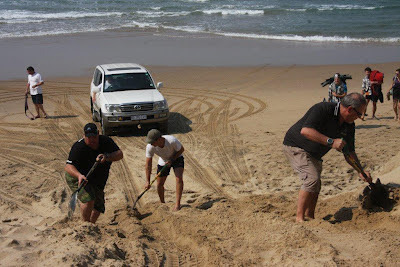 This past week I was up at Cape Vidal with some guys, it was great showing the guys around the place. We had great weather and some how even with a morning out fixing a broken steering helm we dived 3 out of 3 days and had epic calm conditions. 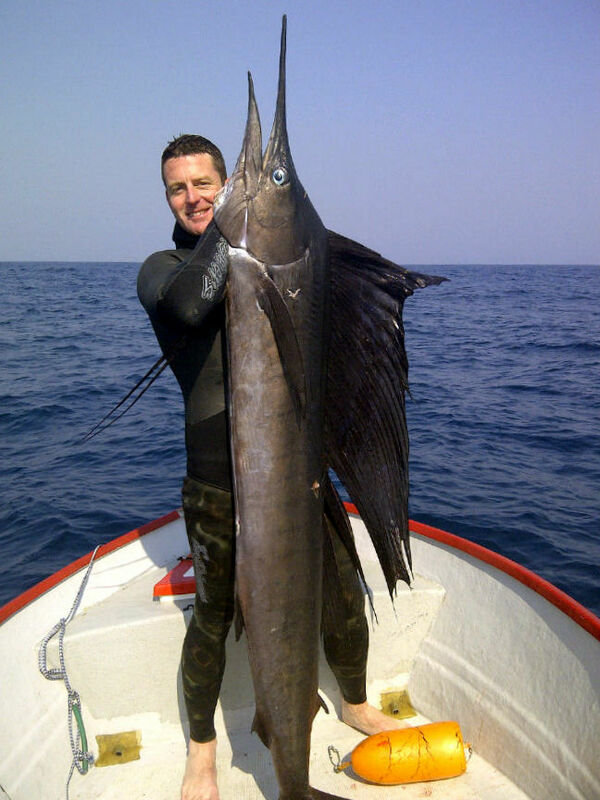 The fish were a little quiet, but Graham managed to bad a great Wahoo of 21kg, the guys saw a couple more Wahoo and a big Sailfish off the point the one after noon. Another shoal Couta off to the deep freeze. 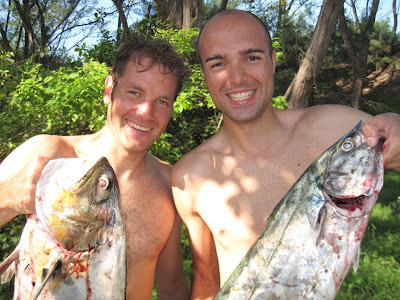 There were a few shoal Couta around and there was no problem getting dinner each night. But it was strange not to see any Snoek. I did manage to find a few Snoek back on out home reefs this weekend on a shore dive, but for the most part it has been very quiet. 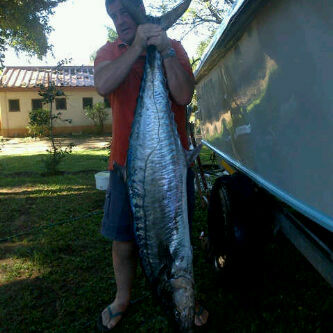 The spearfishing down south has been quiet, with the odd chap finding some fish here and there. By now areas like Hiberdene should be cooking. Maybe its the no show by the Sards that has messed with the situation. On that note the guys in the Transkei waiting for the Sards have almost totally given up. I know of a few guys that have already pulled the plug and come home with not being shoals of Sardines even after a couple weeks. 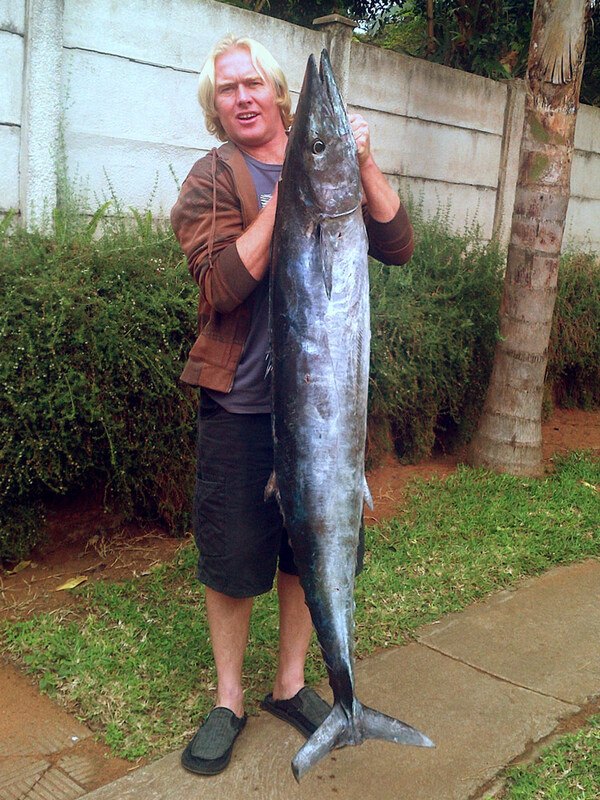 That said there is still hope, and a mammoth Couta of 41.6kg came out at Port Edward ... imagine coming across that beast while diving!! Hopefully this is a sign of good things to come. 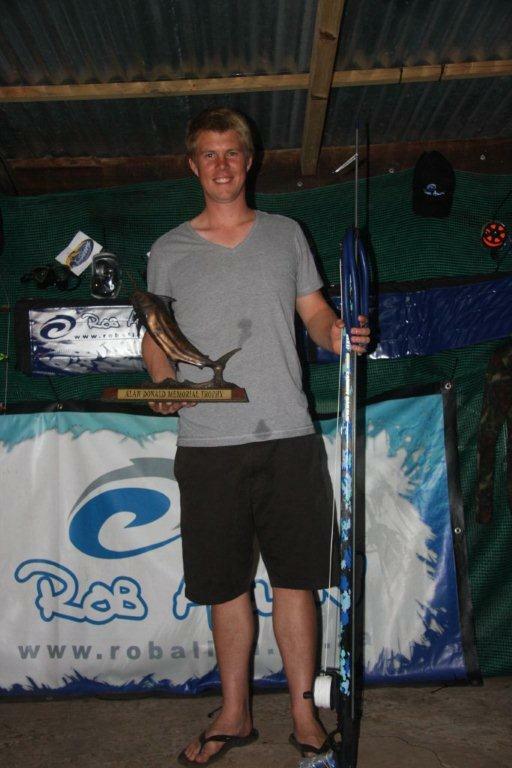 Especially since this week end is the Hibiscus Gamefish Open one of KZNs premeir spearfishing comps with loads of prizes up for grabs including R5000 for the biggest gamefish. Download the HUC ENTRY FORM here. Early winter on the north coast can be seriously frustrating. Either the swell is so good its hard to actually go dive or the dive conditions are so good but there are no fish around ... and you are left wondering why you never surfed. Some guys head further north to Sodwana, Vidal and Mapelane and make the most of the generally epic conditions. Although there are usually not too many fish around it is usually quality fish that come out. Gregg Audie got a 40kg off Sordies over the weekend and I heard that there were also some good size Couta lurking around Vidal. It will be another month or so before the big return Couta fat on Sardines make their way past Vidal, but there are still some good fish around. At home its been very quiet other than the odd Garrick off the points, that said some guys found a shoal of Snoek over the weekend and nailed it. It seems they were very luck as I know every one else scratched for fish. The Daga are slowly making an appearance in the Durban area, and I heard that one or two have been seen on the wrecks already. It is a bit early and we will only start to see the numbers in August. That said rown Colman got a monster Daga a week or so ago off the Bluff. He was in shallow water when a whole shoal swam in on him. I guess that's a good sign and maybe we will get an early run of Daga this year. I know a couple guys heading down to the Kei so it will be interesting to hear what they come back with. Warren Blackmore loving the off shore winds. 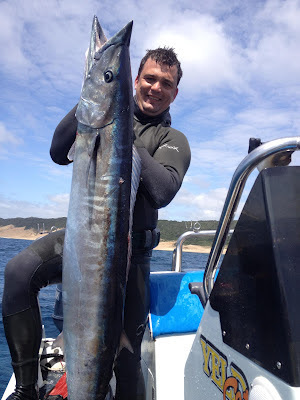 Well winter is upon us and on the north coast the spearfishing kind of goes very quiet. Its a strange time of the year, the summer gamefish have left with only the odd stray Couta lurking around and the winter Garrick and Daga have not quiet got here. On the up side the morning off shore winds groom the winter swells and almost every point from Transkei to Mozambique is going off. So that's what we have been up to the last few weeks ... more surfing than diving. This weekend has more swell and winter winds so next week is looking like a cracker for the surf. 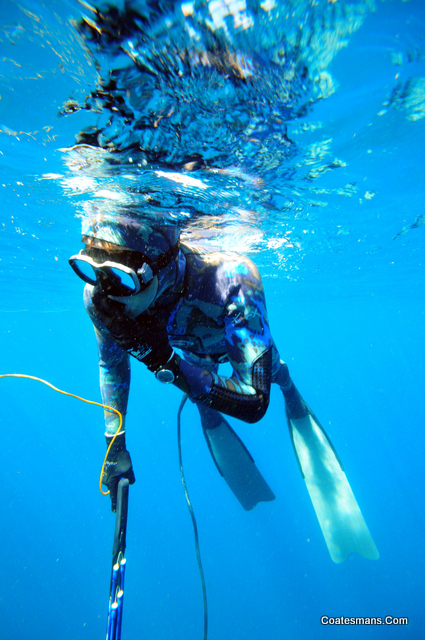 Brod Whittaker has become possible one the best guys utilizing a head cam while spearfishing. I personally prefer to hold the camera in my other hand, as head cam footage can often be very shaky. Brod has this system down to a fine art. You only have to go through and watch through his previous videos to see what I am talking about. 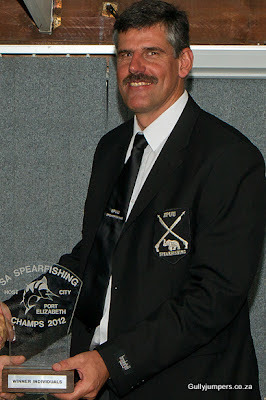 I think we also forget sometimes that Brod is also one of the best spearfisherman in the country, a previous SA champ and he recently finished 6th as SA champs in PE. I guess it is the combination of being a phenomenal dive and a great underwater videographer that makes it such a pleasure to watch his films. This one from up on the North Coast is a cracker ...I hope you enjoy. 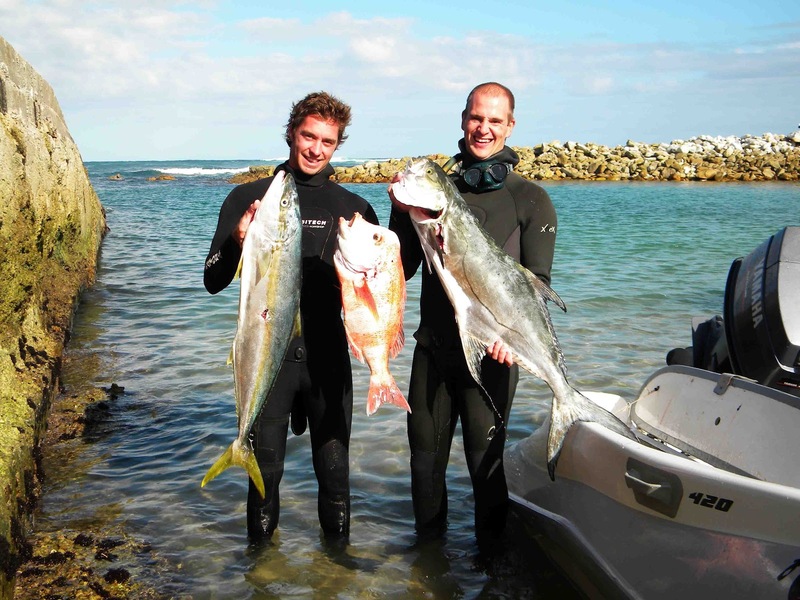 South African National Spearfishing Championships 2012 was wrapped up this weekend down in Port Elizabeth in the Eastern Cape. The windy city lived up to its name and only 2 days were divable. The 2 days were complete opposites of each other. 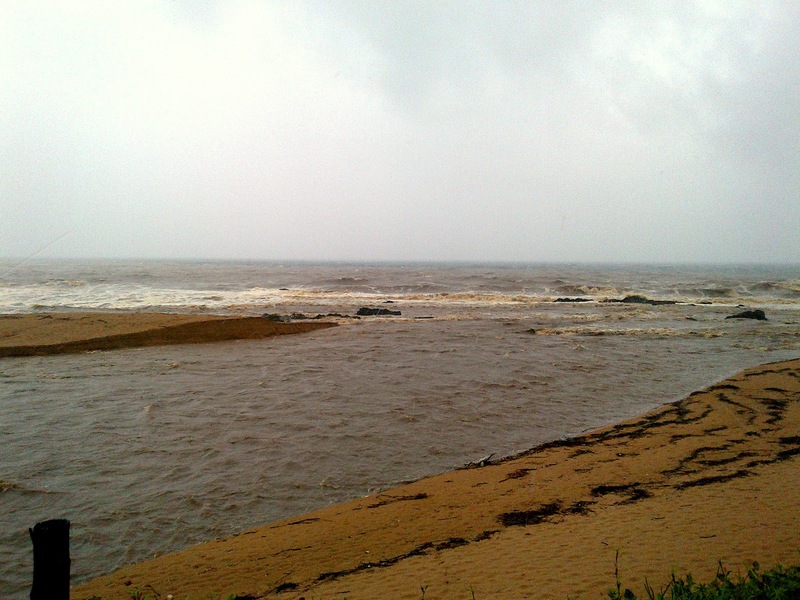 The First Day the visability was far better than what is usually en-counted in the Eastern Cape. Making spearfishing the common species very difficult. 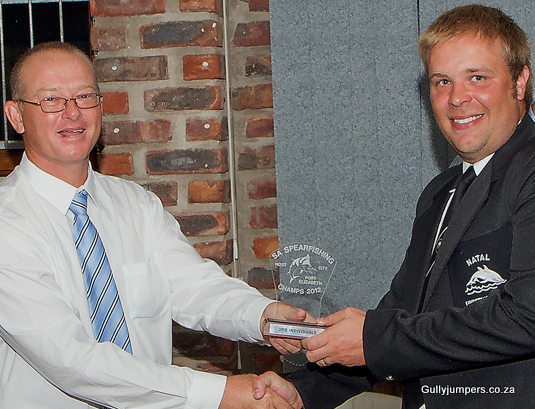 Jaco Blignaut SA's favourite for the event came out in the lead with a small margin with only 9 weighers. Day Two was a complete different affair with the wind turning from the east making the visibility really bad. Eventually sending the guys packing early on in the day, with most guys scratching to find some fish to weigh in. Local knowledge clearly made the difference on day 2 with the local guys having a clear edge at the weigh in. Carl Blignaut who was only a few points behind Jaco going into day 2 put in a big effort to come out just ahead. This gave him just enough points to clinch the title from Jaco when the points were finalised. I could have only imagined the tension going into the last day. Jaco probably wanted another day at sea to have an opportunity to get better points on the board, while Charl was probably praying for the wind not to stop and seal the deal. The surprise in the competition was the Natal B team that stepped up to the plate from Day one. 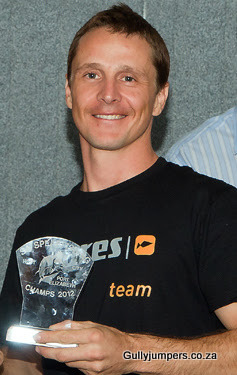 Carl Werner lead the team & proved himself by holding the 3rd spot on both the 1st and second days. And despite some good scores by some good divers on day 2, he came out in 3rd place overall. But its the local boys that had the smiles EP A although being in third position on day 1, came out on day 2 and showed the the other teams a thing or two about diving the Eastern Cape. Martin van Niekerk improved his 1st day score eventually posting a 9th overall with Darryl Hiscock coming in at 12th. The Natal B team came second over all and 1st in the B division were very happy with their position. Day 2 although challenging for the Natal boys they all did well. Garrick Morris started day one in 5th and finished in 4th position over all and Guy Le Meme came in from out of the top 10 on day one to finally finish in a respectable 8th position. 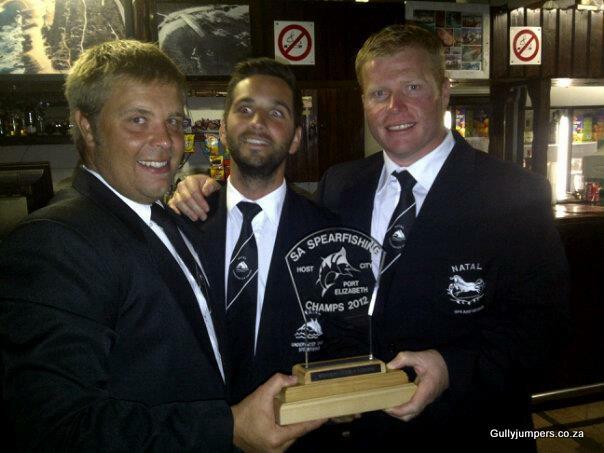 To sum up the SA Spearfishing National Champs for 2012, in just a few words, most of the contestants said "One of the toughest Nationals we have ever competed in". Out of the 6 allotted dive days the competitors only managed to get in the water on a short 2 day window period between the blasting west and howling east. Day 1 proved to be amazing, vis wise, but a desperate scratch for most divers with only 1 diver, the local legend Charl Blignaut, weighing in 10 fish. 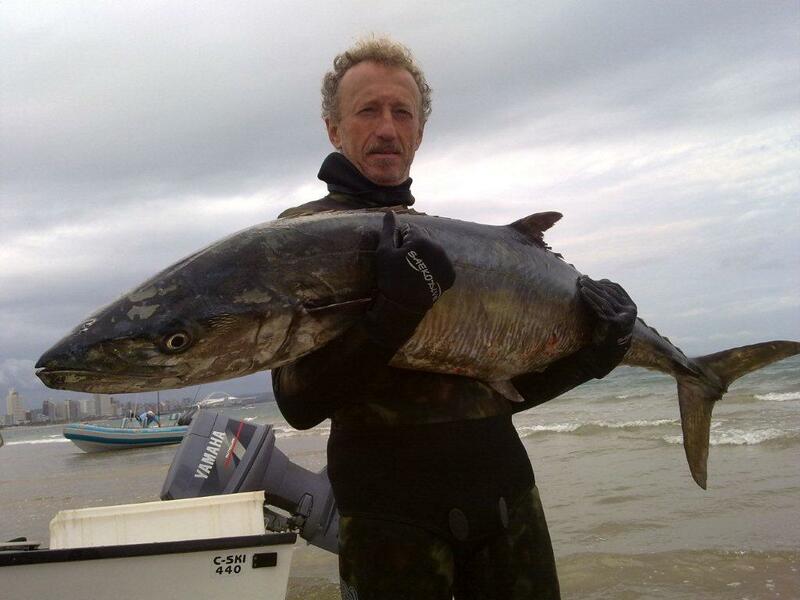 Even so this could not match the quality of fish landed by the SA Dive legend Jaco Blignaut placing Jaco just over 1 point ahead of Charl for day 1. The big question was what was going to happen on day 2. Jaco new that this title was not going to be a steal, Charl knew the area well and with the tough diving conditions looming ahead of them for the second day's diving, local knowledge combined with great diving ability was going to be hard to beat. With day 2 pushing up an icy theromocline making it super tough conditions it again made for some super hard diving. Jaco hit the beach with a great catch seemingly the best catch of the day until Charl beached and started hauling out a catch that most competitors would have dreamed of achieving on a perfect days diving. Charl again the only competitor who managed a full 10 weigh'ers but this time he had 5 maxi weigh'ers giving him a substantial lead over Jaco. This left Jaco and a couple other competitors in suspense for the A Team captons meeting shortly after the day 2 weigh in. The big question now was - Was this going to be the final day of the comp or would Jaco get a miracle and dive again? The decision in the meeting was well stated and, quite simply no matter what the comp situation was if there was no vis to dive in then the would be no diving. A huge bummer for the Jaco as the forecast was not good and he was desperate to challenge Charl's lead. In true PE fashion the 2 days of hard east totally destroyed the vis and any chance of a dive hence leaving Charl Blignait, the EP A team captain, the title of 2012 SA National Spearfishing Champion! A HUGE thank you to Mares for not only sponsoring the event with 25 thousand rands worth of prizes but also for making borrie roles for the competitors and just being there in full support of the competition. Also a huge shout out and thank you to the hosting club, Gully Jumpers, for the months of planing organising and excellent execution of the event. From what I hear the comp was well organised and a big thanks must go out to the local spearfishing club Gully Jumpers for although being in their first year have successfully organised and run a main event like Nationals. 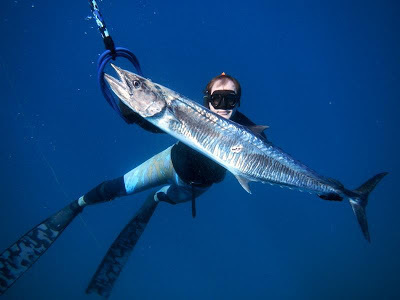 New come to the scene was Mares who with a strong presents and support at the event have put their stamp on South African spearfishing in a big way. I guess for all competitors it back home now and get ready for the next round of trials in prep for next years National Championships. Congrats to Charl and the EP A side for cleaning up, and to Jaco for always putting in a strong appearance at any competition he enters. Oh and of course lets not forget Carl, Garrick and Guy from the Natal B side, I am sure they will have plenty ammo at the bar for months to come as to how they beat the Natal A side. Local favorite Charl Blignaut notching up some maxi weighers. Conditions at the second days diving at the South African National Championships made a turn for the worst and the divers had to put in some serious effort to get some quality fish. Local knowledge came in really helpful as the guys in the know managed to still get some good fish. With the next few days not looking good, and the possibility of the divers getting in again looking slim, the committee running the event have not released yesterdays scores. They say that the results are really close and they want to keep the final result for the prize giving on the weekend. Jaco Blignaut one of SA's top divers making sure he is not out done. I have however been sent an report by Richard Leonard for Gully Jumpers regarding yesterdays diving. Day 2 started off with light easterlies and clean water in the deap but the competitors soon found ot that it was going to be way more challenging than they thought. The thermocline had pushed in and at most places from 10 meters down there was a radical temperature shift from 18degees to 10 degrees in temperature. The report announced that the east wind was going to increase through out the day gusting up to 25 knots by 11am. The pressure was on, the competitors knew they needed to find their fish early on in the day before conditions got too bad too dive in. Well the forcast was dead on, the wind started howling by 11 and the water got progressively worse. It proved to be a very challenging dive day for the competitors with most divers scratching out 3-6 weigh'ers. A nice surprise was the Geelbeck and the ever so saught after Miss Lucy or as the EC divers call - Stump which made an appearance in some of the bags. 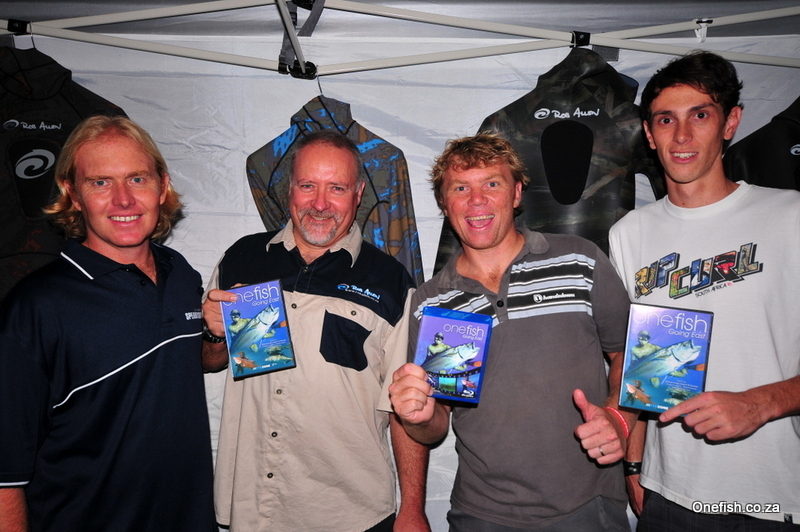 The big show down and point of suspense was between 2 SA dive legends, Jaco Blignaut and Charl Blignaut. The question was how would Jaco be able to contend against Charl the local champ with local knowledge. Jaco Beached first with a great catch, better than any one else at that point, that was untill Charl hit the beach and started unloading his hatch. It seems local knowledge combined with great diving ability gave Charl the edge and a amazing catch of 10 species - again the only diver of the day to achieve this but what really blew us all away was the 5 maxie weigh'ers in his bag with a 14.5 KG tail to seal the deal as the diver in the lead of this competition. The results will remain un announced as the weather is up, the divers are not diveing today and there might not be another dive day for the rest of the comp. The results will be anounced on Sat evening after the prize giving. Local boy Darryl giving some of the top divers something to think about. We hope that this is not it for Nationals 2012 and hope that tomorrow sees some diveable conditions. I know from the reports I have gotten back from the Natal boys is that its been tough, very tough. I will have the final results up before the weekend is out. As always Jaco Blignaut coming out on top. 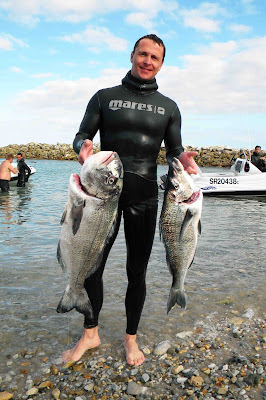 South African National Spearfishing Champs hosted by EP's Gully Jumpers Spearfishing Club finally got under way yesterday after a few days of strong west winds. The day proving to be quite a challenge, the divers got some great viz for PE, 10 - 15 meters in most spots. This clean water however proved to be difficult to hunt in with only one contestant the local favorite, Charl Blignaut, weighing in his full quoter of 10 fish. EP-B team with some really good weighers. Some of the surprises were Deven Swart a development spearo diving with the EP B team coming in at 4th place with an awesome eastern cape mixed bag and Terence Bellingan also EP B team shooting the fish of the day. A 12 KG Garrick on the bottom at 23meters depth, insane!. 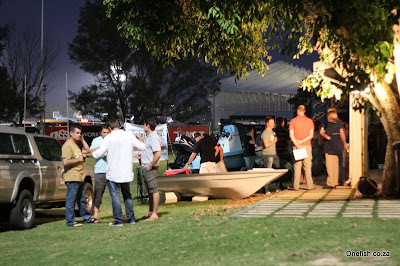 A huge thank you to Mares who have not only donated 25k worth of equipment in prizes for this years event but are also at the event in full force showing their support for the sport of spearfishing in South Africa. Will keep the you up to date as I get more info. A little over a week ago the North Coast Spearfishing Network group was started on Facebook. There have been similar groups that have worked really well, the Capetown come to mind. The idea is to share whats going on, and hook up with guys spearfishing in the area. The need for guys to network was the primary motivator for the group as there few ways for guys to meet up and get to know each other on the North Coast, especially further north. Craig Harper with a good North Coast Couta - Its that time of the year! Already the group is a hive of activity and some great pics 'above' have been shared and guys have used the network to meet up for dives. So why not go have a look at the North Coast Spearfishing Network and join in if you feel the group would be of value to you, or better yet if you think you could add value to the group. Le De Beer is one of South Africa's great Spearfisherman. For the last 20 years Len has been on the forefront of South African Spearfishing, successfully competing provincially, nationally and international for South Africa. Len finding the only Couta around in in Nov 2011 on a short visit home. 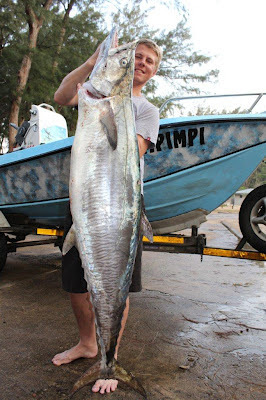 For the past few years he has been living in New Zealand but comes home occasionally, last year he was home during November and while every one was fumbling around looking for a half decent fish he shot a 25kg Couta of the Bluff. Here is a great vid the our man Brod Whittaker on the the Legend Len De Beer. This is Vol 9 in Brods very popular Youtube series. Cyclone Funso gusting winds at 165mph! and heading south! 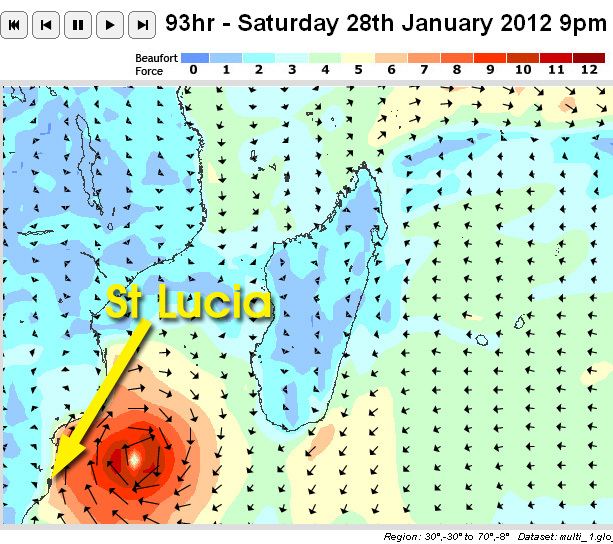 Saturdays forecast shows the cyclone directly off St Lucia! The long term projected forecast shows the cyclone heading southwards reaching SA late Friday night. 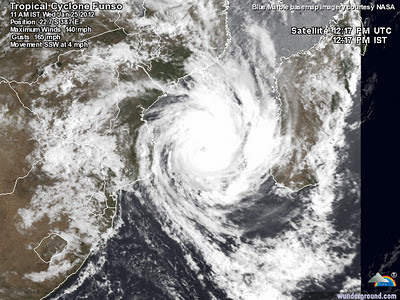 The cyclone should head south and out to sea, but there are no guarantees and it pass over land like cyclone Demoina did in the 80's.